Home » Todd Park » HHS and Data and Technology, Oh My!! HHS and Data and Technology, Oh My!! Last week I had the pleasure of attending a talk called, "Unleashing the Power of Open Data to Improve Health" organized by The College of Physicians of Philadelphia-section on Public Health and Preventative Medicine. The speaker was Todd Park, the Chief Technology Officer for the US Department of Health & Human Services (HHS). I have to admit, I was expecting something a little dry (having received my fair share of power point overload at government sponsored presentations). Wow- was I surprised to find Mr. Park on a wireless microphone running up and down the aisles engaging members of the audience! The presentation focused on how HHS is living up to President Obama's "Open Government Initiative", which promises to have a "system of transparency, public participation, and collaboration". In terms of health data, Mr. Park said let's stop making people find data. Instead, let's "make data find people". In order to develop channels to help data find us, HHS has been engaging leaders from many areas of popular social media and technology (e.g., YouTube and Smart Phone application development). The government team has been sending the message "the data is yours...let's see what you do with it". In order to get the creative juices flowing, HHS has held and continues to hold "Health 2.0 Developer Challenges". The most current being the "Go Viral Collegiate Challenge" which calls on multidisciplinary teams from colleges and universities to develop a web or mobile application to address a significant health problem facing their communities. Asthmapolis: A device that uses global positioning satellite technology (GPS) to determine the time and location when an asthma inhaler is used. The data is then stored on a server. The user can use this device to track asthma symptoms, triggers, and medication use- which could lead to an identification of environmental or other factors which improve/worsen their condition. In addition to these challenges, HHS has also launched multiple websites to assist with the dissemination of this open health data. 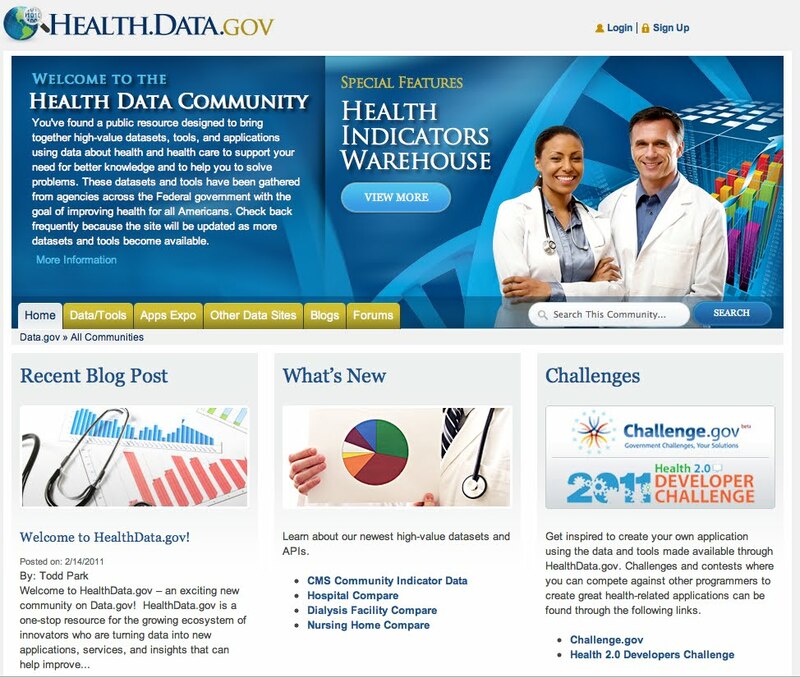 For example, HealthData.Gov and HealthIndicators.Gov. While this is all fabulous (and I really enjoyed looking at the challenge applications), how is this initiative being evaluated? Is the ultimate goal just about numbers? Does HHS just want to increase the number of people/organizations that are using health data? Do they just want to increase the number/types of data sources they can make available? Or is there some evaluation of the quality and accuracy of what is being produced? The challenge application website is sure to point out that the applications were not produced with federal money and therefore the government does not endorse them. But are they somehow creating an inventory of the applications and evaluating their effectiveness? Do we know which ones are actually increasing knowledge and changing behavior? Are we learning from the ones that do not? I applaud all the excitement around this initiative, but as always- I'm interested in seeing the outcomes. How will this initiative, which "unleashes the power of open data" actually improve health"? Related Posts : HHS and Data and Technology, Oh My! !